The 10-year-old was winning for the 12th time over fences and has earned a place in the hearts of punters all over Ireland. Only five runners went to post, but it wasn't easy for 7-4 chance Roi Du Mee as four of them were still in with a chance at the second-last fence. Grand National candidate Spring Heeled was nursed into contention by Davy Russell, but the biggest danger was Foildubh, who gave the front three five lengths for much of the race before creeping into contention in the hands of Paul Carberry. He appeared to be travelling much the better going to the final obstacle, but Roi Du Mee kept on digging in for Bryan Cooper to win the Grade Two event by half a length, with favourite My Murphy finishing unplaced. 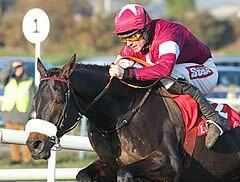 "He's in the cross country at Cheltenham and the English National. He's not getting any younger so we might give him a rattle at the National. "He's won a Graded race for the last four or five years, every year, and I wish I had a few more like him."